Ellen will be quick to tell you that she’s not an artist, but her dozens of paintings over the past thirteen years tell a different tale. 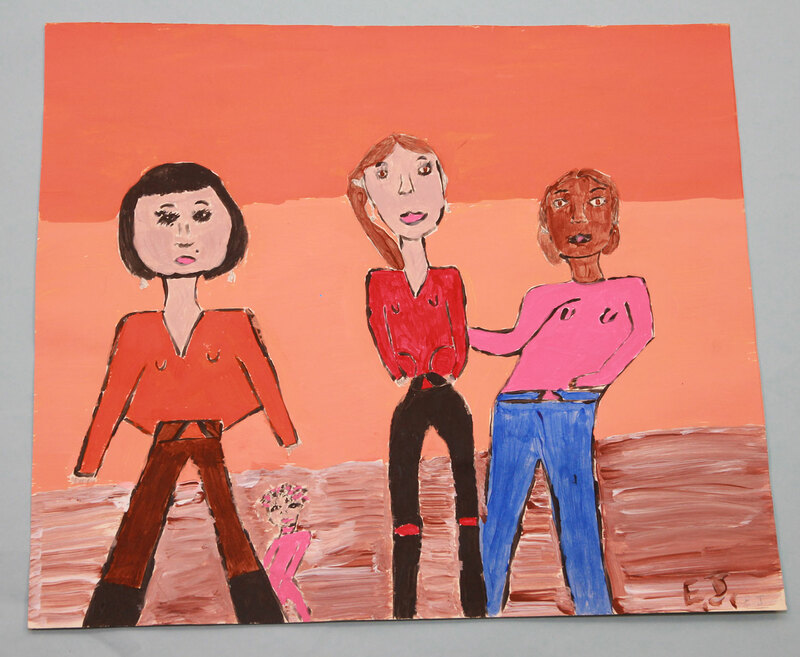 When she first started in the art therapy program in 2004, she says that she didn’t really know what she was doing. “I was just throwing paint on. But I kept coming back every time that I could.” Today, Ellen paints with skill and focus, selecting the subjects of her paintings with care and consideration and always trying to learn something new — from Donna, our art therapist, and also from her fellow artists. Picasso’s art can be broken up into periods — the Blue Period, the Rose Period, Cubism, etc — and so too can Ellen’s. 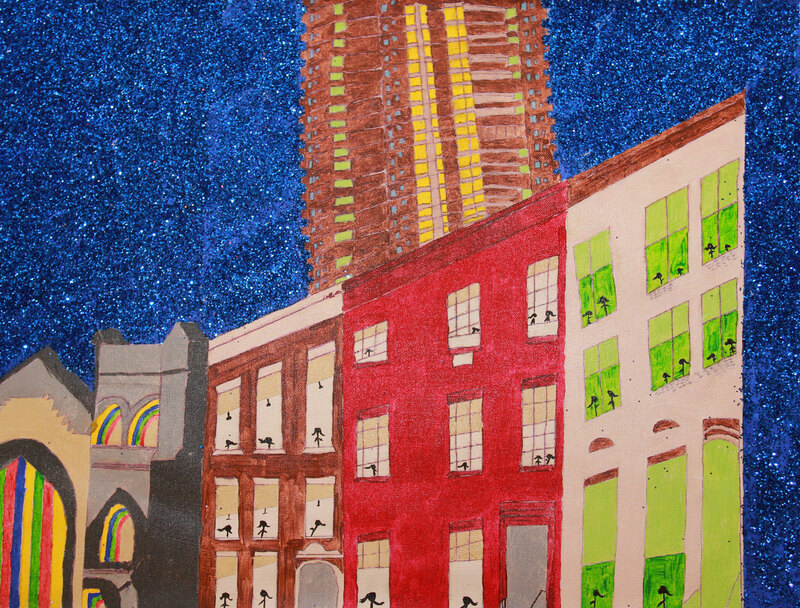 First came experimentation — her “throwing paint on the page” phase — followed by people, and now buildings. But why buildings? “Buildings keep me in tune with reality,” Ellen explains. Life can be hard, emotions can be confusing, but buildings are solid, grounded, real. 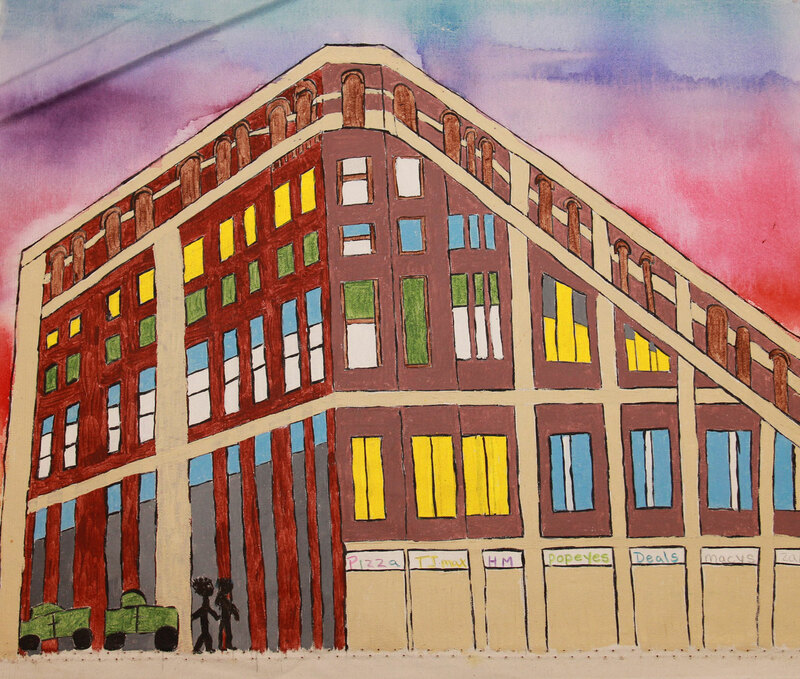 When Ellen paints buildings, she focuses in on the details: windows, reflections, shapes, and lines, recreating the building from a photo with precision. But she also finds ways to make the art her own. 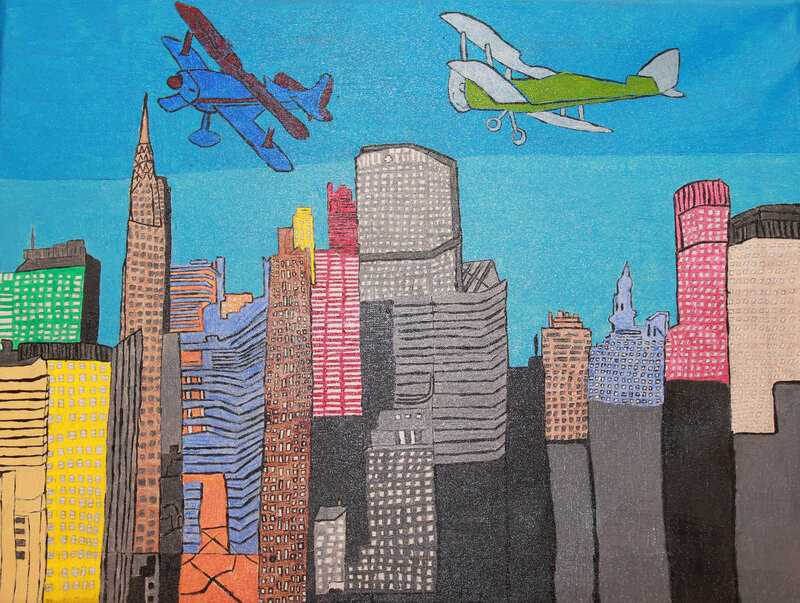 In one painting, the sky is a beautiful watercolor, set in contrast to the building’s exterior. Sometimes Ellen chooses buildings from far-flung places to paint: her current work is of the Duomo Cathedral in Milan, Italy and it’s going to be “faaabulous!” she exclaims. But other times, her pieces are a bit more personal. One is of a city block right here in New York. One piece features a housing projects building in the background. It’s so tall that it goes out of frame at the top. “I used to live in the projects,” Ellen says matter of factly before moving on to discuss her other artwork and her time at Harlem United. “I love Harlem United, it’s my second home. I do therapy, I do art, I do groups. It keeps me focused on not thinking on the negative things in my life,” Ellen shares with a contagious smile. 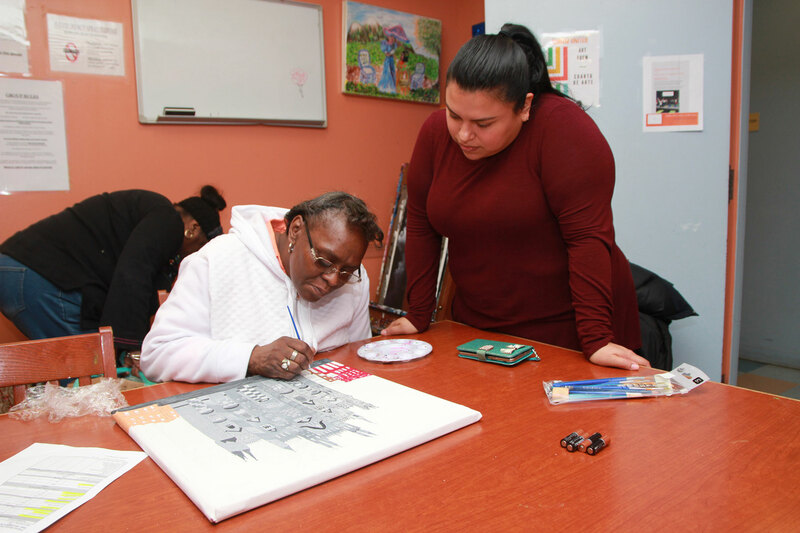 Harlem United’s art therapy program is just one component of our Adult Day Health Care program that combines individual and group therapy, medical and dental care, hot meals, nutritional counseling, peer support groups, and social activities for low-income New Yorkers living with HIV/AIDS, many of whom are also dealing with other health concerns. The goals of Adult Day Health Care are to remove barriers that stand in the way of clients getting the care they need, make it easier for clients to start and continue treatment, and reduce the need for hospital visits. This holistic approach to healthcare is client-led and focuses on supporting the participants in their health—and life—goals. For Ellen, that’s meant improving her physical and mental health… and of course, learning to paint. No Replies to "How art therapy is changing Ellen's life"